What to get the kids. That is always the BIG question, right? Sometimes it’s easy because they have their lists, but if you’re like me then you like to throw in a few surprises too. Here are some fun gifts for kids you might like. 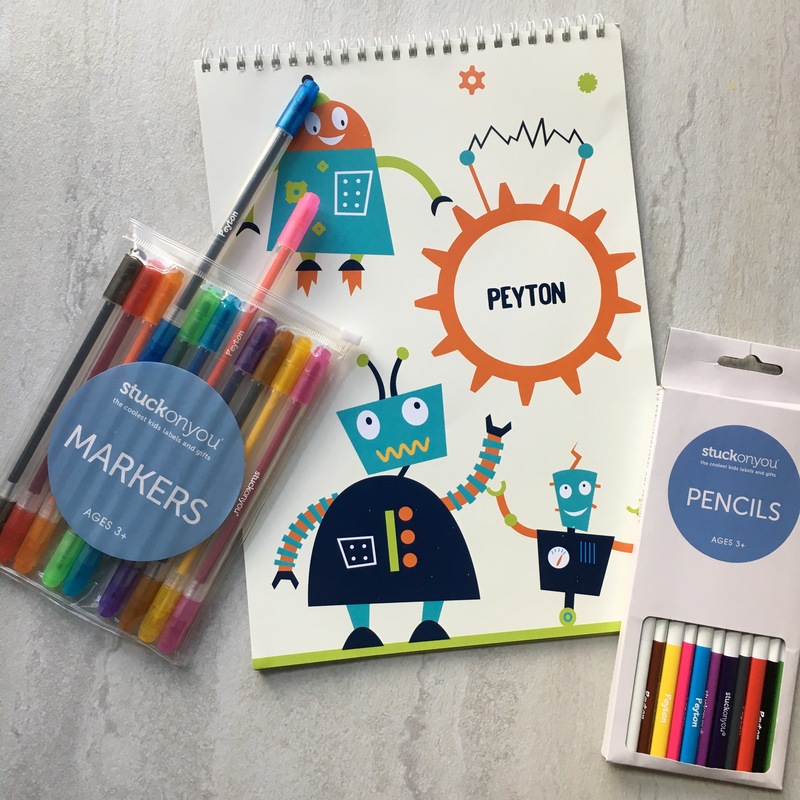 The Budding Artist Kit is the cutest personalized gift for any artistic child. Choose your Design, Color and Font to make this drawing tablet your own. It also comes with markers and colored pencils that also have their name on them! Stuck on You is full of fun personalized ideas including LunchBoxes, Backpacks, Blocks, Puzzles, Stickers and so much more! 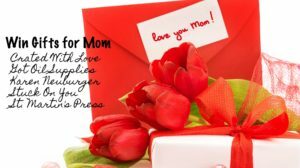 Stuff for Mom too – check out my Mom’s Gift Guide and see what else you can win! P’Diddy is home for school this year and boy I can now see what all the hype is about fidget toys. They really do help him because he can’t sit still for long. He was thrilled to test out ZURU’s Tangle and he loves the shape and design of it. Pull it apart, wrap it around, fidget with it all you want. You can even connect multiple Tangles together, so of course he wants more! Found at Walmart and Toys “R” Us, the Tangle is under $5. Grab multiple ones in all colors – Classic, Crazy, Metallic, or Sparkle. I think it makes a great stocking stuffer! You’re heard about kids and slime, right? It’s the big craft going on. We recently made slime for the first time a few weeks ago and can I tell you I had to go to 2 different stores and spent way too much money to get what I needed. This Slime Science Kit is all you need for $7.99. Your kids will love making 5 different kinds of slime! Did your kids go through the rock stage? P’Diddy is in it right now. He loves collecting them, studying them and yes keeping them in his room (!). 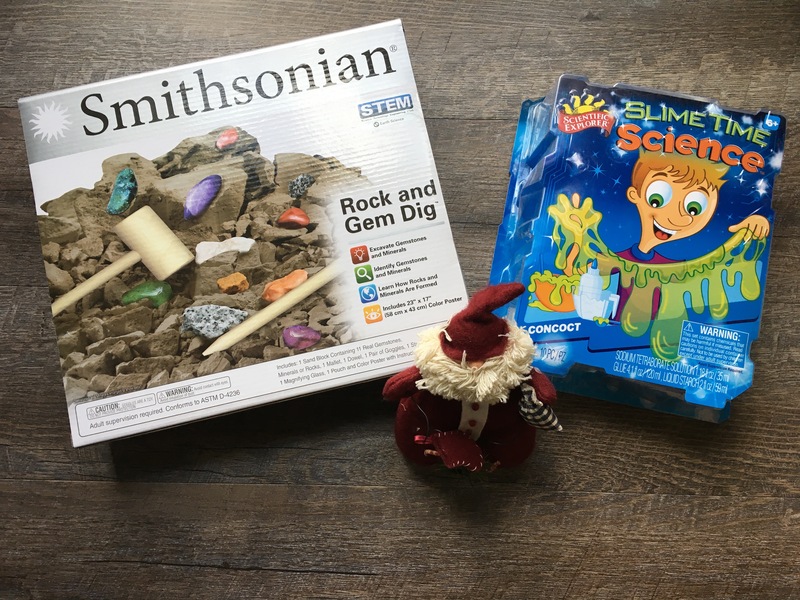 This Smithsonian Rock and Gem Dig Science Kit is a blast because he can now excavate the minerals with tools included and learn all about gemstones. A little scientist you will have! The Boys Scouts of America Scout Shop may be an expected place to find gifts, but check it out. You’ll find tons of STEM-related science kits for a great price. I found a couple on sale for as little as $2.55! Even though it has already snowed 4 times here, I couldn’t get a picture of this gun in the real snow since there currently is none, but that is exactly what it is for! This Arctic Force Snowball Blaster is the ultimate weapon you want in a snowball fight. Insert your snowball and blast it out! Wham-O has lots of fun toys for all seasons. If you’re looking for winter play, be sure to check out the the Snow Bow, Snow Slingshot, and Snowboogie to play in the snow too. You can find most of their stuff on Amazon. 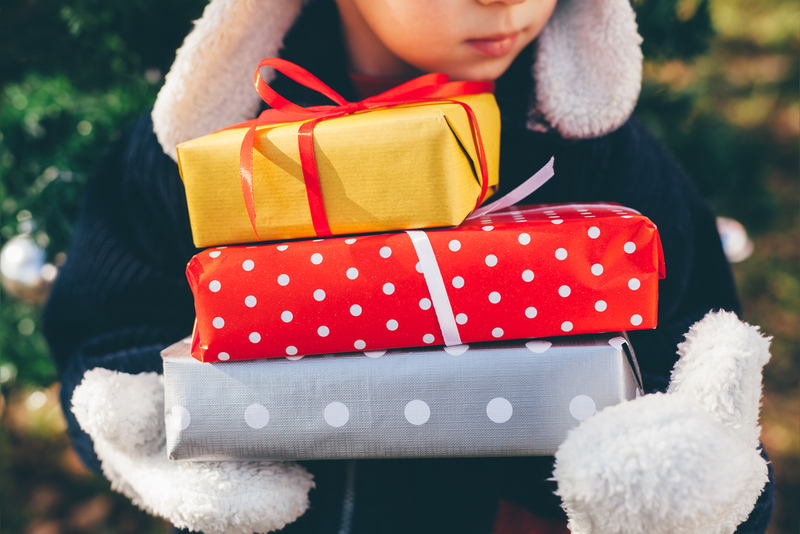 What do your kids have on their List this year? I partnered with all these companies who sent me these items for free. All opinions are my own. Amazon links are affiliate. This giveaway will end on Dec. 1, 2017 at midnight MST. Winners will be drawn via rafflecopter. Once a winner is drawn I will contact them and they will have 48 hours to reply before I draw a new winner. Giveaway is open to anyone in the US. You must be 18 years of age or older. Giveaway is not affiliated with Facebook & I release them of liability. Winner will be posted in the rafflecopter widget. I think age-appropriate puzzles (and books, of course) are great gifts for kids! I've gotten different Smithsonian kits for my grandson in the past and he really liked them! I've been looking at art supplies for my nephew. He's been into Prismacolor lately. Also, I've seen a lot of cool robot toys that I think he would like. I like the Smithsonian Rock and Gem Dig Science Kit for my granddaughter. I have 7 grandchildren from 9mo. to 9 years. I want to get all of them nerf guns accept the baby for Christmas. My older daughters are really into crafting and coloring , I really like the gem dig set. I am glad you included some science toys. Those are my favorite to give to kids any time of the year. I like the ZURU tangle. Oh, so many items in this post that my 6-year-old would love! I think the Smithsonian kit would be the first thing she would play with, as she loves rocks, gems and digging. The Smithsonian kids toys are some of my favorites because I get to teach the kids science. I like giving kids a book and a toy of some sort. I really like the Snowball Blaster you have posted. I think kids would have lots of outdoor fun with it. I love the Slime time Science and the Smithsonian sets because I homeschool so not only do they look fun we could use them as part of our curriculum as well!! I love these ideas! Really creative and fun! I know my 8 yr old would love all these gifts. My son would like a Nintendo Switch this year. My daughter loves all the little gadget stuff from places like 5 below. I have a really pretty Corelle doll put aside so far. 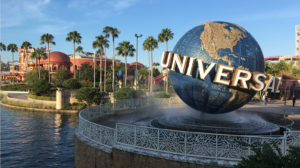 What a great fun package to win! I like them all, especially the Smithsonian rock kit. I like buying STEM products. Not only are the kids having fun, but also learning. 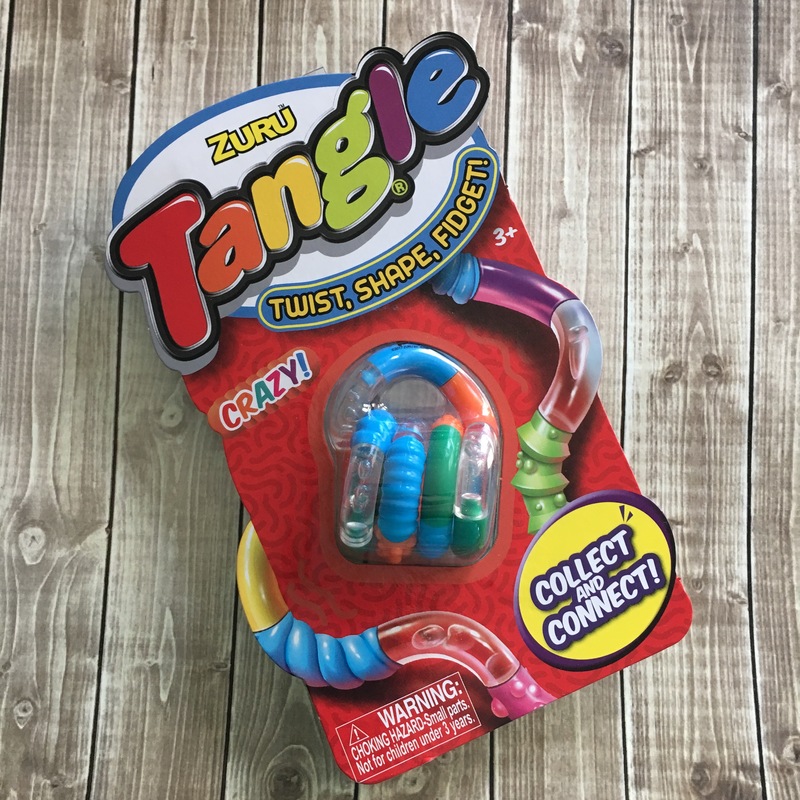 The Zuru Tangle looks like something my grandson would like. My daughter would LOVE the slime kit! I love to get my two daughters and my husband something silly or fun that they are not expecting at all! Love surprises. My kids love creating art, so canvases (with paints) are a nice gift and they are pretty inexpensive. I'd love to have the Smithsonian Rock and Gem Dig Science Kit for my grandsons because they would enjoy learning about gem stones. My nieces love art and would have fun with the markers. All the toys look like fun. This year my daughter wants DIY arts and crafts kits, educational science books, and some fun new clothes. She turns 8 next month. I think she would love all this stuff! My son has been having fun with slime. I like craft related gifts, I think they help with small motor skills and are fun to do. The rocks and gems would be something the kids would love. I think that every child should receive at least one book for Christmas. I have a nephew who would like the Smithsonian® Rock and Gem Dig Science Kit for sure! Love the budding artist kit - my nephew would be a fan of that. I gave the rock and gym dig to a friend's son and he loved it. My kids love crafty items and LEGO! I'm a fan of science and arts and crafts kits. I like getting the kids off of the iPad. Our kids would love these. I really like the Zuru. My younger grandson is crazy about Barney so Ive been looking for anyhting close. EBay. A few items on my daughter's wish list are art supplies, books, Hatchimals and a bike! We love to have snowball battles. It's part of our yearly winter snow fun. I would love the snowball blaster. I love the ZURU Tangle. With 19 grandchildren I always have a big list. One wants waffle blocks, another a firetruck, a robot, a doll, etc. I do like to give my grandchildren books for Christmas--you can never have to many books. The Zuru is my favorite. He is fascinated by rocks and shells, I think he would like the Smithsonian Rock and Gem Dig Science Kit the most. Puzzles are big in my family. Thanks for the chance! Toys that last like Legos are great. I also have an art lover who always needs books and supplies replaced. Legos are a go-to present for my boys,they enjoy hours of creative play together. I have five grandchildren and of course each one wants something different. One wants Nerf stuff, another jewelry, another wants a wallet and things to go in it and one wants games for his X-box. The snow blaster looks like so much fun! How did I not know these existed? We live in a very snowy area and it seems like it would be super fun for the family to do! Thank you for the wonderful giveaway! I love non electronic toys like board games or card games. My daughter would love the Rock & Gem dig! That snowball blaster is TOO cool. I have a 10 year old grandson who would love that. My youngest is in her last year of high school but we do have 7 grandkids. The youngest is two and probably looking for a doll for her. The other thing is these fingerlings (?) for her older sister, along with another grand daughter who is 6. I'm out of the loop and have been reading some blogs to see WHAT is the new cool stuff. I am getting my kids these cool sketch boards! Very excited about them. The Smithsonian rock and gem dig looks very educational! I would love to surprise my daughter with the Slime Science Kit! My niece loves to do arts and crafts, so art kits are a great gift idea for her. She likes to play outside and one of her favorite toys is a hand held garden shovel and pail. She enjoys making mud pies for the garden fairies. My granddaughter wants a white pony (real) and my grandson wants some Paw Patrol toys. My daughter wants LOL dolls & my wants a robot dinosaur for Christmas this year! I like to get my kids a book, movie, game and 1 toy that they want. My kids like board games and toy figurines. My son would love the Snowball blasTer! I love giving games as gifts. the slime time kit looks cool. From your list, I like this item:. Smithsonian Rock and Gem Dig Science Kit. Samsung Nook tablets from Barnes and Nobles. These are pretty cool gifts for the kids. I am almost finished Christmas shopping. I still have a few things to still get but just about done. My daughter is currently making a variety of slimes using household ingredients so the Slime kit looks gift worthy. My kids and family are readers, so books, games with some complexity and anything STEM work this holiday season. My grandsons like legos and hot wheel cars! The Gem Dig Set is pretty cool! My daughter loves doing stuff like that! Thanks for all the wonderful ideas Slime Time Science is super cool, my kids would be thrilled. The tangle toy looks like a great stocking stuffer. I like the Slime Time Science. My nephew loves things with weird textures and loves slime! Winter is so long in Central Maine, I know my grandsons would love the Snowball Blaster! 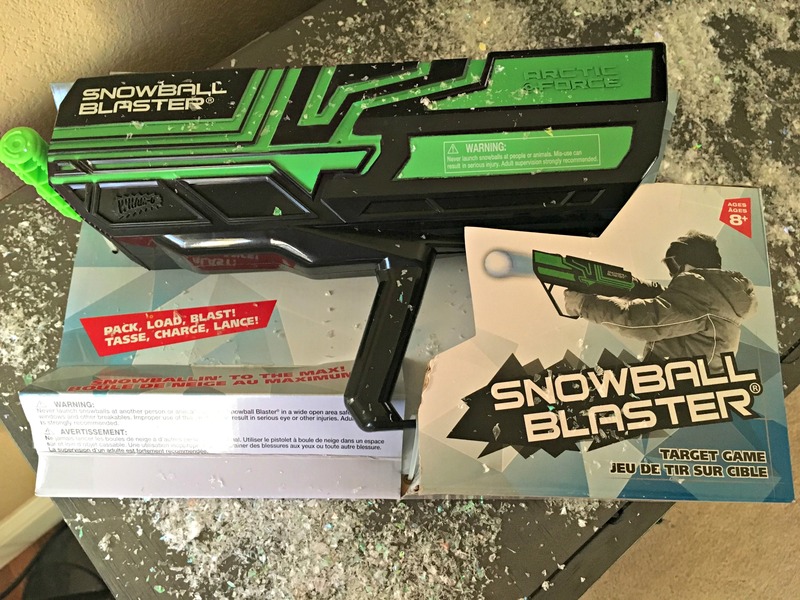 My oldest daughter would love the snowball blaster! I love the Rock and Gem Dig. I have four kids they would lime gem dig set and anything arts and crafts they love. I like the Smithsonian Rock and Gem Dig Science Kit on your holiday gift list. I think Slime and age appropriate Science kits are great gifts for kids. I love the snowball blaster!!! I've got my eye on the Wonder Workshop Dash Robot.